Stan's OCA 'Progressing with Digital Photography' Blog: Have to start again somewhere! It’s over a month since I posted to this blog – Christmas & New Year, yes OK, but the longer you leave it the harder it is to get started again! Things have been happening & I do keep up with jottings & reflections in my notebook, but I really need to get back into the Learning Log proper, so this is by way of a starter. A rapid overview of what I’ve been up to will suffice for now – perhaps! I got a ‘commission’ to do a piece of work before Christmas. Those inverted commas in the previous sentence are really important! There is a passageway in our house where three holiday photographs that I took years ago have hung, mocking me, for some time. The ‘commission’ was to come up with something to replace them – and I was keen to make it something that had some ‘meaning’, not just any old landscapes! We had decided that a series of about eight, smallish square frames would work well; so what to put in them? I have produced what I guess would best be described as a ‘still life’ series, entitled ‘It’s a dead leaf!’. There is some oblique reference there to the tendency we obsessive photographers have to drive friends and family mad by seeming to want to photograph obscure and mundane objects and situations. However, there was some element of serious intent in what I produced. I’m always keen to make the ordinary special – I’ve blogged on here before about that. Maybe there is some deeper meaning in it somewhere. Perhaps I want people to notice me and the metaphorical version is getting them to see beauty in the mundane through the images I produce. 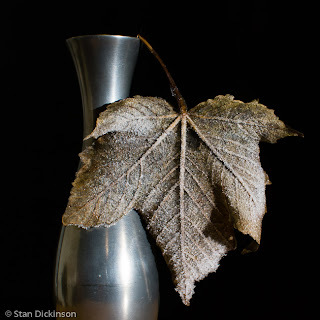 Not sure – but I went out into the garden on a couple of occasions in early December, and gathered together a motley collection of dead and dying leaves, flowers & general detritus. Then, over a further couple of days, I photographed them under artificial lighting against a pure black background. I quite deliberately looked for a variety of arrangements and patterns within the planned square frame – using a small pewter vase for one or two images. Two of the images had to be produced particularly quickly because I chose to capture objects with frost on them. I found that process to be significant and symbolic in itself – the ‘decisive moment’. I was creating still life images, but of something transient, something that could only be there for a short time, something which seemed to go against the traditional idea of a still life. Of course, the whole series is about transience, briefly stopping the passage of time, capturing something that we mostly don’t even notice. Taking that dead leaf, which we could just as easily have stepped on and crushed to a pulp as we walked over it, and giving it a starring role. This is the image from the series that I think captures the idea best of all. That’s real frost on it, and it flopped over in this way because it was quickly thawing and losing the temporary rigidity the frost had given it. It is only a dead leaf, but I think it’s standing for a lot in this image. It might even be partially representative of me risking a step or two towards the darker zone from which I might look back and better understand what I’m trying to do. So – that’s certainly got the reflective learning log going again! The images appear in a set on Flickr, here "It's a dead leaf" . I commented, after my ‘studio’ based work for Assignment Two, that the ‘conceptual still life’ genre was something I was interested to explore further. I was given this small book as a birthday present - "Still Life in Photography" by Paul Martineau. The short introductory essay provides a good overview with pointers to further investigation and a reading list – a nice starting point for further study. The images then provide a similar visual overview, from Fox Talbot to Ori Gersht and Sharon Core. Coincidentally, the National Media Museum has an exhibition on called ‘Art of Arrangement’. Rather like the book, the exhibition sets out survey the part that still life has played since photography first emerged in the 19th century, and to relate that it is stiull alive and kicking in contemporary photography. I’m not sure the title ‘Art of arrangement’ does the show any favours, especially from the publicity point of view. Accompanying notes and essays (downloadable from the NMM website, with some videos to view as well) do make reference to the ‘rich and symbolic language’ of still life and the subtle conveyance of ‘complex and spiritual ideas’. So, to imply, however unintentionally, that it might be an exhibition about flower arranging is not the wisest thing! Actually, although disappointing in regard to the number of more contemporary examples (partly, I suspect, because the NMM is largely limited to its own collections plus the Royal Photographic Society archive), it does, like the book, give a useful intro to the genre, its historical context, and the deeper meaning and significance of ‘serious’ still life images. The range goes from prints used by Fox Talbot in his ‘Pencil of Nature’ publication, through extensive examples from Roger Fenton, works by the pictorialists, notably Steichen, on to Atget, Kertesz and the surrealists e.g. Man Ray, via Don McCullin (an odd choice for still life!) to Chris Killip and a projected animated work by Ori Gersht. My impression is that there is genuine activity in the photo-art world that could most definitely be defined as ‘still life’ (in so far as such definition and classification is of any consequence – which is debateable!). For example, Hotshoe‘s December/January edition featured Diana Scherer’s Nurture Studies work, which I’d seen at the Nofound Fotofair, in Paris, and liked very much. So, on the one hand, I’m encouraged that the genre is alive and kicking, but a little put off that this exhibition doesn’t really add to the story – certainly in the contemporary context. It could be argued that Ori Gerhst’s is subverting the genre, by making it move and exploding its contents. The credibility of the exhibition wasn’t, in my view, helped by the inclusion of a filmed interview with Don McCullin (again, I say, odd choice!) in which he says that his still life work isn’t meant to be taken seriously and is a bit of an escape to ‘the shed’ for him. Great photographer that he is, within his field of experience and expertise, I’m not sure that his view, which seems to dismiss the genre as a ‘hobby’ for him, is helpful in assessing the position of ‘still life’ in contemporary photo-based art. Mind you, some might disagree, I guess. I’ll keep an open mind and get back to working out how I can best progress with my Paris Photo project.